If you have one of those gardens that suffers from garden drainage problems then don't worry, we can help. There are large areas of Shropshire on clay soil. Rain water is very slow to drain through the ground after long spells of rain and the garden can quickly become water-logged. If water holds against timber fences or brick buildings this makes the situation a lot worse. 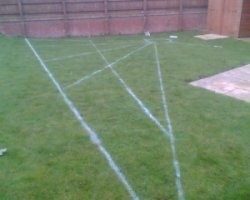 We can deal with water drainage as the initial phase of a garden makeover project, or we can deal with the garden drainage as a project within itself, whatever is required. Firstly we look at the levels and find out where the rain water is holding. Then channels are dug in a Herringbone formation across the affected area. These garden drainage channels are usually directed into new drainage sumps. Sometimes they can be directed into garden beds where there are moisture loving shrubs and trees such as Marsh Willow. Perforated pipe is then dropped into the garden drainage channels to carry the water and this is surrounded with pea gravel. The ground is then restored to its former stage and the site thoroughly cleaned. We have dealt with a lot of garden drainage problems across Shropshire all with complete success. 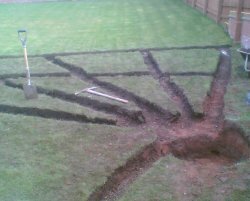 Recent projects include a large garden in Ellesmere and a garden drainage problem with a housing development near Newport.